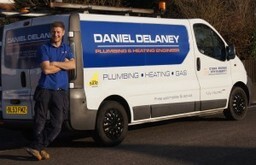 Testimonials are curated by Daniel Delaney Plumbing and Heating Engineers and are not independently reviewed or verified. "I'd recommend Daniel. He knows what he's doing. He's a clean and tidy worker and he does the job properly." "Daniel is a very efficient plumber , we found him to be reliable and highly skilled . He fitted a new heating system with boiler for us , we were very happy with the job and would gladly recommend him . Oh nearly forgot , the cost was also good"